"I must say this recipe goes great with most Italian dishes. I usually make it with chicken Parmesan. Delicious!!" In a bowl, mix together the butter, Parmesan cheese, garlic, marjoram, basil, fines herbs mix, oregano, black pepper, and parsley until thoroughly combined. Split the Italian bread loaf in half lengthwise, and spread each half generously with the butter mixture. 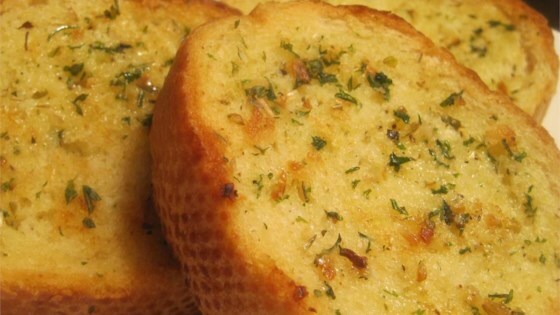 Bake the garlic bread on the top rack of the preheated oven until the butter mixture melts and bubbles, 10 to 15 minutes; turn on the broiler, and broil until the bread is your desired shade of golden brown, 1 to 2 more minutes. This was only ok for us. We didn't care for the marjoram and fines herbs. Great spread, lots of flavor. Much less mess than sprinkling the seasoning over the top. Thanks this was perfect with our spaghetti supper. I have made this several times for family gatherings. Everyone absolutely loves it.